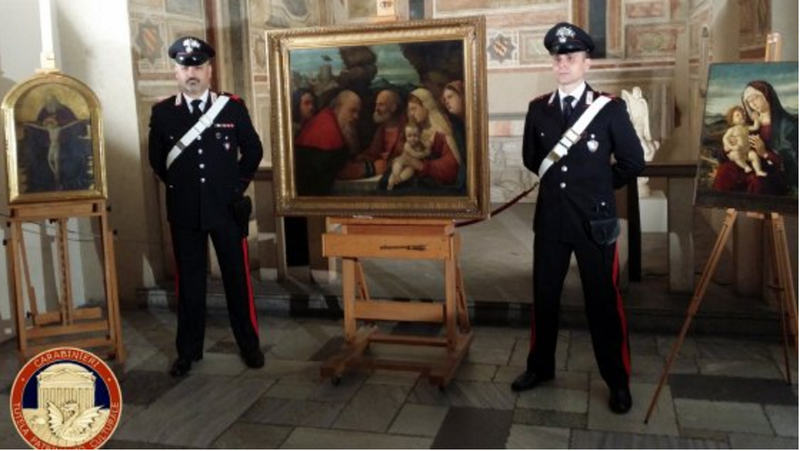 Three 15th century Italian Renaissance paintings, seized from a villa of the then Prince of Luxembourg by Nazi forces operating in Camaiore, Italy in 1944, have been recovered by Italy's art crime police, the Comando Carabinieri Tutela Patrimonio Culturale. Presented in an exhibition in Brera announcing their recovery, the paintings had been siezed by German forces after Italy entered World War II, when Luxembourg had been declared an enemy state and allowed for property seizure under wartime law. 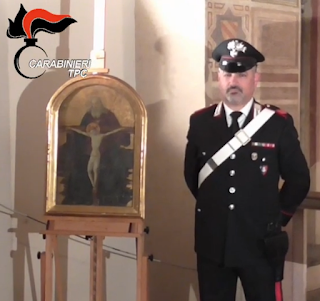 In a press conference held today in the Sala della Passione in the paintings gallery of the Academy of Brera, Riccardo Targetti, the public prosecutor of Milan, and Alberto Deregibus, the deputy commander of the Carabinieri TPC unit, presented the three stolen works of art which have been missing since World War II and which had been recovered during a lengthy investigation dating back to December 2014, when the first painting was identified by law enforcement authorities in the Monza home of a Milan-based family. an oil painting on canvas depicting depicting Christ's Circumcision and Presentation at the Temple (83x101 cm) by Girolamo Dai Libri (1474-1555) a Verona-based an Italian illuminator of manuscripts and painter of altarpieces who worked in the early-Renaissance style. 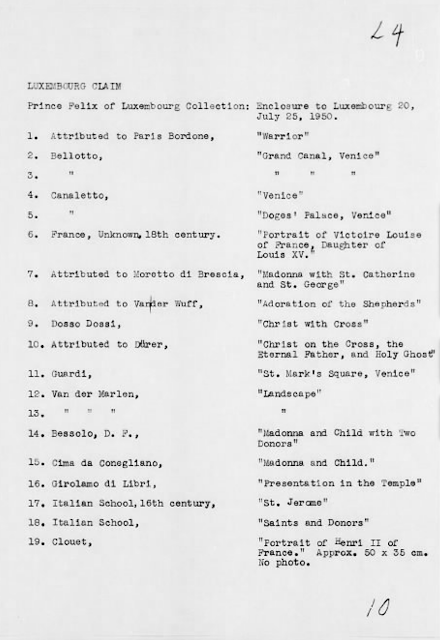 While the press conference did not specify which members of the Luxembourg noble family were heirs to the three missing paintings, a trace of the Records Concerning the Central Collecting Points ("Ardelia Hall Collection"): Selected Microfilm Reproductions and Related Records, 1945-1949, Restitution Files Of MFAA Section - Berlin, 1956 › Claims-Italy, Luxembourg, Netherlands, Norway give us a clue. 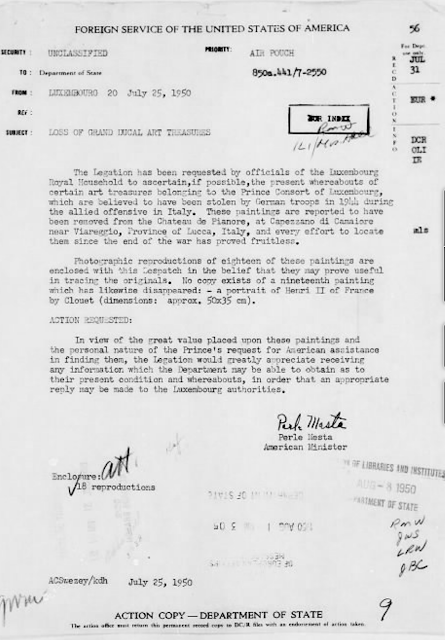 As the attached photos clarify the stolen paintings were most part of the collection owned by Prince Felix of Luxembourg who requested formal assistance from the allied forces in recovering 18 art treasures belonging to the Prince Consort of Luxembourg Royal Household stolen by German troops in 1944 during the allied offensive. 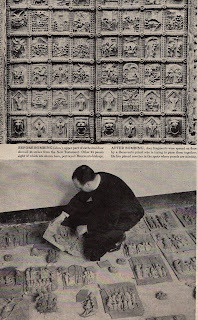 The paintings were removed from the Chateau de Pianore, at Capezzano di Camaiore new Viareggio, Province of Lucca, Italy. Timing can be everything. 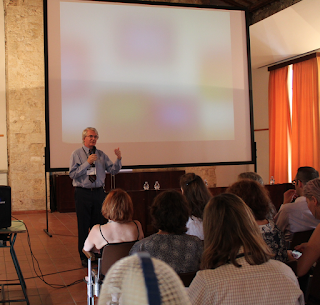 I had just returned home to Chicago a week after attending this year’s conference in Amelia. Not long after leaving the airport my family told me about an old issue of LIFE magazine awaiting me at home (Figure 1). 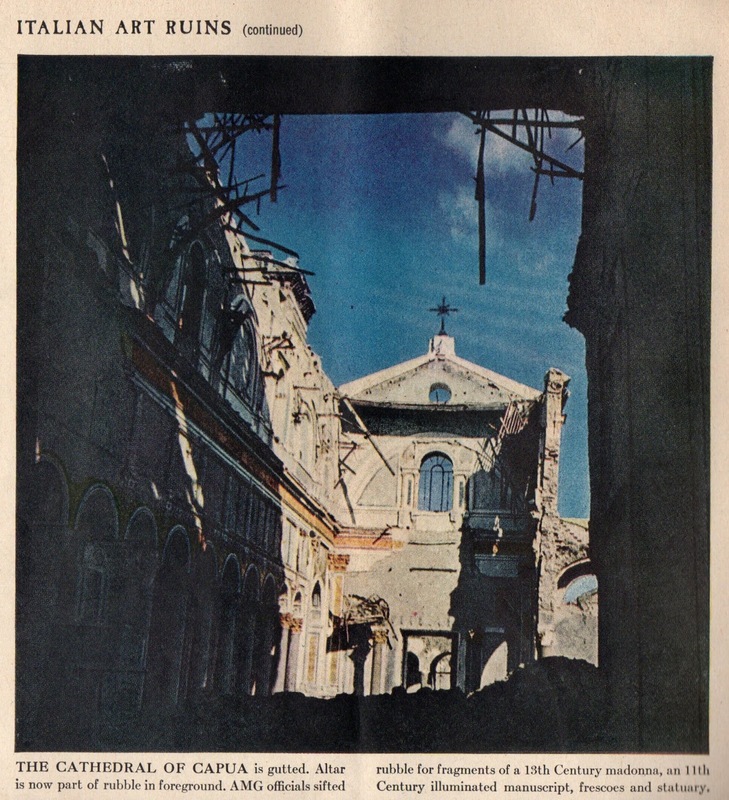 Dated 24 July 1944, it contained an article about the destruction of Italian art during World War II. What better tie-in to the ARCA conference, since several speakers addressed the loss of cultural property amidst the ongoing conflicts in Iraq and Syria? It was an opportunity to put current events in perspective. The Allied invasion of Italy was well underway by the summer of 1944. Rome had already been liberated by Allied forces, who were continuing to advance toward German defensive lines in northern Italy. Southern Italy was secure and damage assessments had begun. 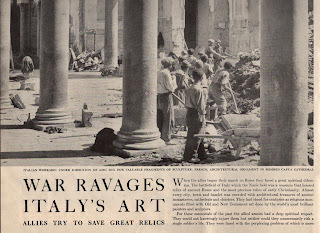 Despite efforts by Allied command to preserve monuments and art whenever possible, not everything in Italy could be spared. Photojournalist George Silk was sent to document the destruction of churches in three Campanian cities – Capua, Naples and Benevento – for this LIFE photo-essay, entitled War Ravages Italy’s Art: Allies Try to Save Great Relics. Why would someone reading the news care about the shelling of a church halfway around the world? Funny how the same question could be posed to readers in both 1944 and 2015. 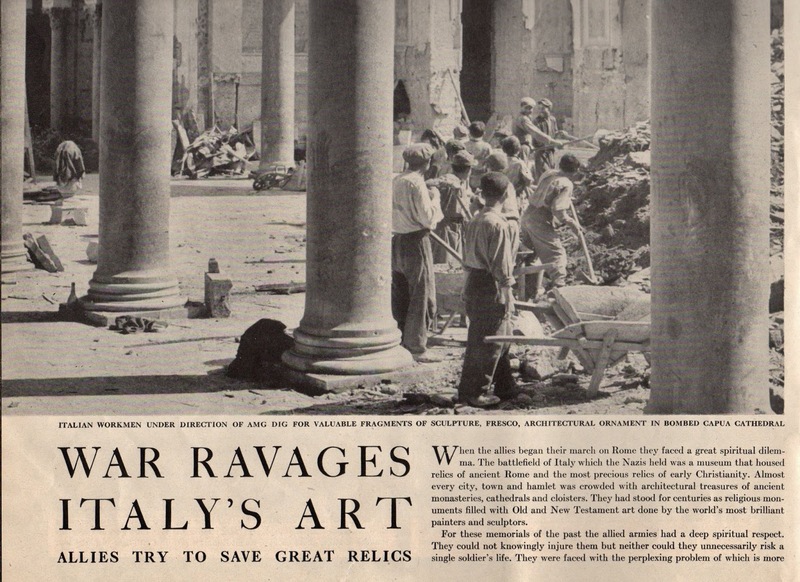 And yet I think our grandparents and great-grandparents did care about the suffering of art in WWII Italy. Not because our greatest generation was made up of art lovers, but because of the unity that comes from a common purpose. Everyone was deeply invested in the Second World War. One only has to look at news, advertisements, pop culture and public service announcements from that era to understand that the war effort pervaded every aspect of their lives. I have this LIFE magazine today because my great Grandpa Myers used them to compile his own scrapbook of the war as it happened. Countless other civilians did the same. 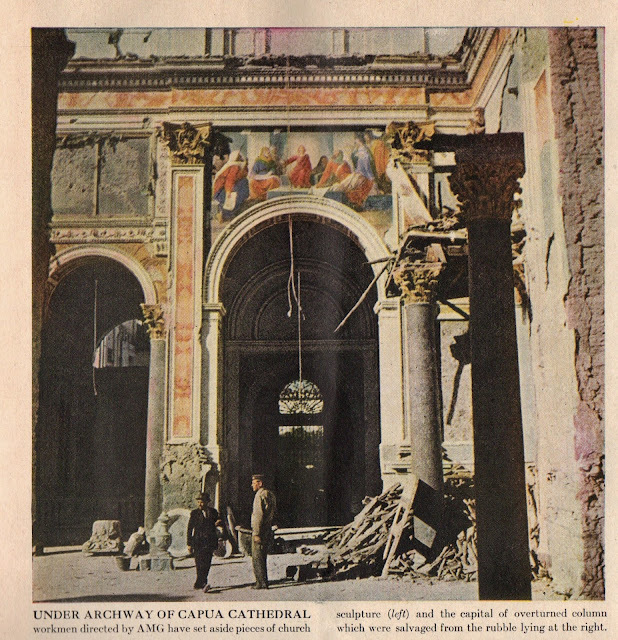 Today’s monuments men are often civilians with little or no access to the conflict zones where art is being destroyed. Or else they are a courageous few on the inside who risk their lives to save their people’s heritage. All of them are repeatedly called on to justify their cause. At best their audience is a society focused on issues closer to home. At worst they are faced with indifference. Sadly, foreign wars have become something that is easy to ignore if you choose to do so. My generation (and subsequent generations) of Americans can’t relate to the collective efforts of those who lived during the world wars. Unless you actually know men and women on active duty, war has become something you can switch off with your remote control or a click of the mouse. It is both a luxury and a shortcoming of our time. 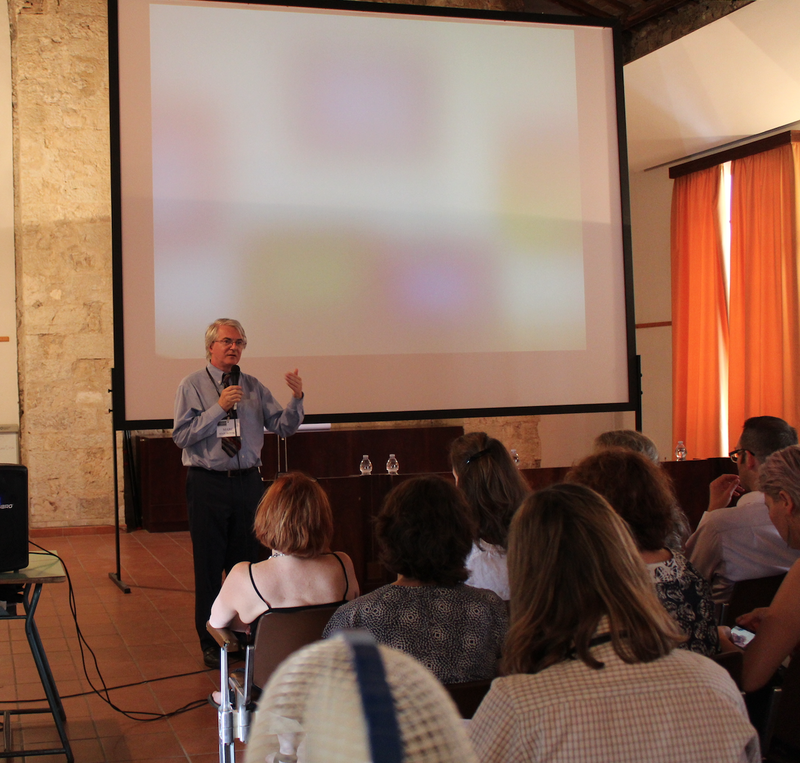 The best way to interest people in 21st century cultural heritage protection may be through grassroots efforts. Start at home. Engage your friends and loved ones. Seek out local art groups or historical societies and inform them about these issues. Build networks, however small they may seem at first! It all adds up. In that vein, I’d like to thank my mother for bringing the LIFE magazine article to my attention. Thanks also to my friend (and fellow 2014 ARCA alum) Bryce McWhinnie for uploading it into the research database at the Monuments Men Foundation for the Preservation of Art. 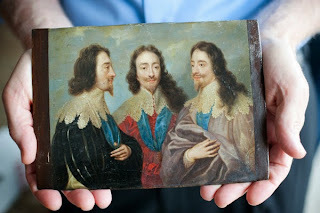 In the early 1630s, King Charles I was busy cementing his place as omnipotent English monarch. He had been crowned King of England in a sumptuous ceremony, and in June 1633 he was likewise crowned King of Scotland. His queen -- a quiet but persistently devout Catholic -- Henrietta Maria, so memorably portrayed by Van Dyck in such overtly political family portraits as The Great Place and in intimately affectionate portraits such as his Charles I and Henrietta Maria, was carefully trying to strengthen ties between England and Rome, and to prepare the ground for the arrival in London of the first Papal envoy since Henry VIII’s time. 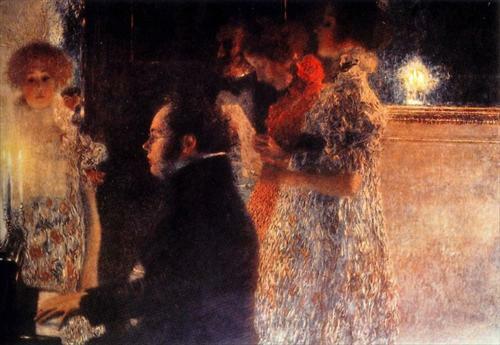 As so often happened during Charles’s reign, the delicate diplomatic dance was executed, in part, by artistic means. In mid 1635, Charles and his queen commissioned Van Eyck, now firmly ensconced as Charles’ favourite painter, to prepare a portrait that they would send to Pope Urban VIII in Rome. Thus would then able the Pope to commission his own favourite sculptor, Gianlorenzo Bernini (memorably labelled by Robert Hughes as the “marble megaphone of the Renaissance”), to carve a life-size bust of Charles, which the Pope would then give as a gift to Queen Henrietta Maria, symbolizing (so the Pontiff hoped) closer ties and perhaps heralding the ultimate submission of the English Crown to the throne of St Peters. Drawing inspiration from Lorenzo Lotto’s Portrait of a Man in Three Positions, then in the Royal Collection (now in the Kunsthistorisches Museum, Vienna), Van Eyck executed the sublime triple portrait of King Charles, both embodying his character and pensive but unshakeable hope for the future, and giving Bernini everything he needed to create his marble bust. The Portrait was sent to Rome. Bernini wove his sculptural magic. The result arrived back in England in the summer of 1637, but not without significant travails and perils: the bust was packed into a wooden case, and one Thomas Chambers spent three remarkable months bringing it across Europe on boats, horses and mules, besting pirates, robbers and corrupt border guards en route. In the meantime, and despite any such divine imperfections or portents, Charles was delighted with the bust, especially given that it was created by the Pope’s favoured sculptor, who would otherwise have been inaccessible to the increasingly artistically astute and sophisticated but still resolutely Protestant, Charles. 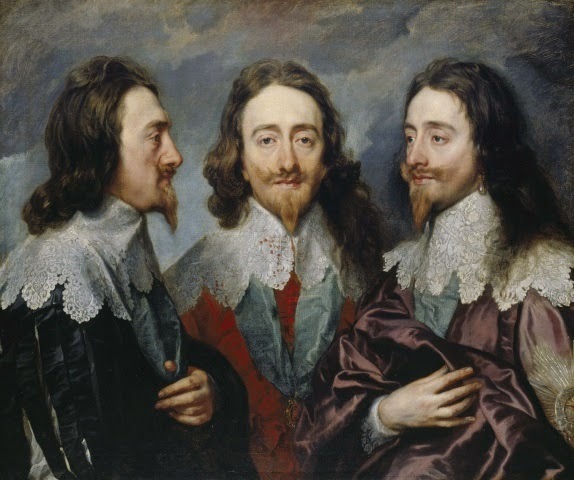 On a chilly January morning in 1649, and wearing two shirts so that any shivers brought on by the cold would not be mistaken for fearful trembling, Charles was executed, under authority of a Death warrant signed by the 59 men who would become known to history as the Regicides. 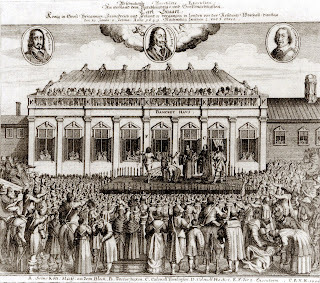 It is unclear whether the irony of the execution taking place outside The Banqueting House in London, whose ceiling was (and is) adorned by magnificent, and politically powerful, paintings by Rubens commissioned by Charles over a decade earlier, was noted at the time. Following his death, the Commonwealth set about valuing and selling off “the Late King’s goods” to raise funds for a severely cash-strapped Treasury. And amongst the art works sold during a chaotic, corrupt and ultimately largely unsuccessful asset sale process, was Bernini’s bust. By 1651 it was in a slightly down-at-the-heel and crowded impromptu dealership owned by one Emmanuel de Critz, one of many that sprung up all over London as the King’s art flooded onto the newly created, and never before seen, open art market. “The King’s head in white marble done by Bernino at Rome” was on display in a cramped house in Austin Friars, with a price tag of £400. That asking price must have been too high. 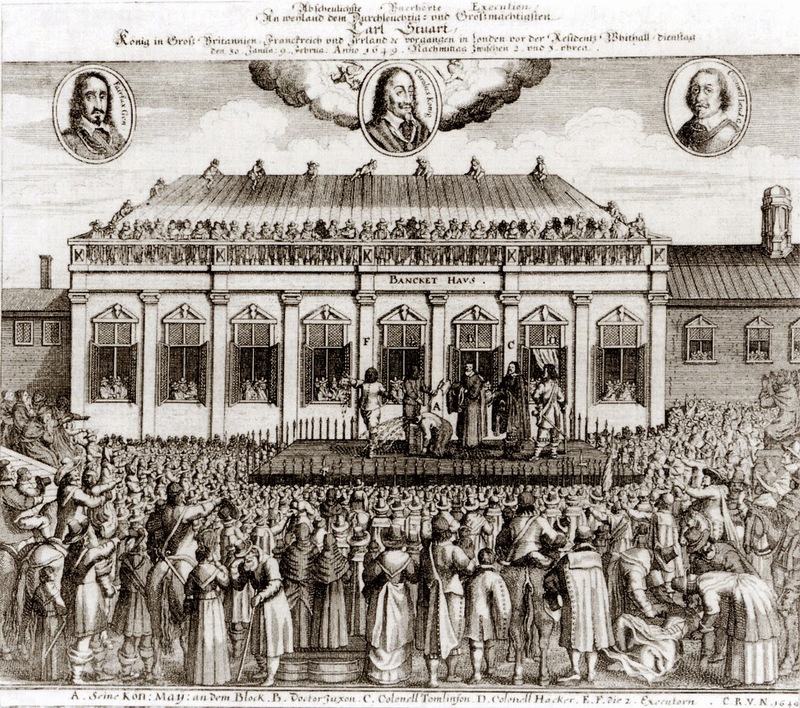 In May 1660, following the unforeseeable (in 1651) lurch of history that saw Charles II restored to the English Throne following years spent wandering Europe in beggarly exile after his defeat in battle by Oliver Cromwell in September 1651, Charles II set about swiftly and ruthlessly reclaiming his father’s art. In a staggeringly audacious lie, de Critz petitioned the new King for back pay of £4000 and, amazingly, £1200 for costs incurred in acquiring and looking after the late King’s art, including the Bernini bust. History does not record what response this petition triggered. De Critz himself died of the plague in 1665. 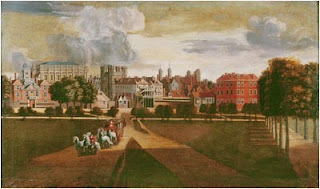 "The Old Palace of Whitehall by Hendrik Danckerts"
That day the bulk of what had been the largest palace in Europe, exceeding both Versailles and the Vatican in size, and at its zenith, comprising 1500 rooms, was destroyed. Only the Banqueting Hall remains more or less intact, but Bernini’s Bust of Charles 1 disappeared. Painted for Bernini about 1637 from which he was to execute a bust and sent to Rome. 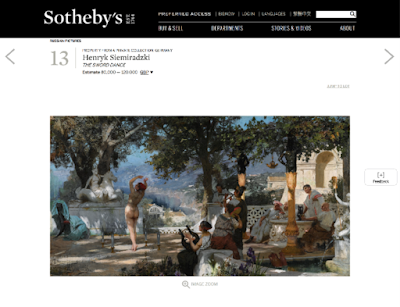 Collections: Bernini family; Mr Irvine: Walsh Porter; Mr Wells. Purchased by George IV in 1822 from Mr Wells for 1000 guineas. 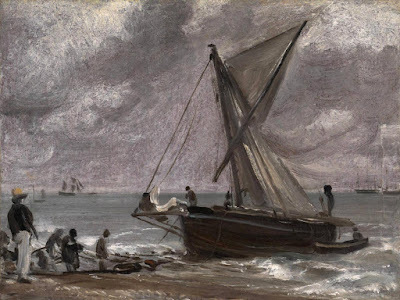 Judge Arthur Tompkins of New Zealand will return to Amelia this summer to teach "Art in War" for ARCA's 2015 Postgraduate Certificate Program in Art Crime and Cultural Heritage Protection. Jennifer Ann Minton is a transplant from Southern California, who decided to make Washington, D. C. her home after graduating from the University of Texas at Austin in 2000. She has worked at the White House and various U. S. departments. She received her J. D. from Catholic University of America’s Columbus School of Law. 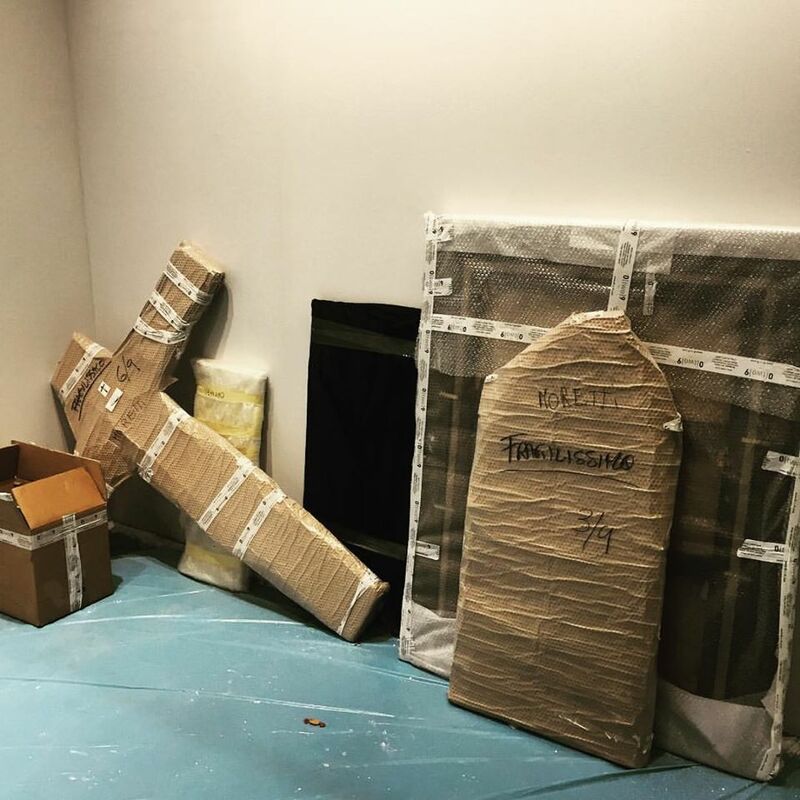 ARCA blog: How would you explain to a layperson – someone who is only conversationally knowledgeable about art law – whether or not claimants have been successful in European courts in recovery Holocaust-looted art and why the American courts seem to be the answer for so many cases? 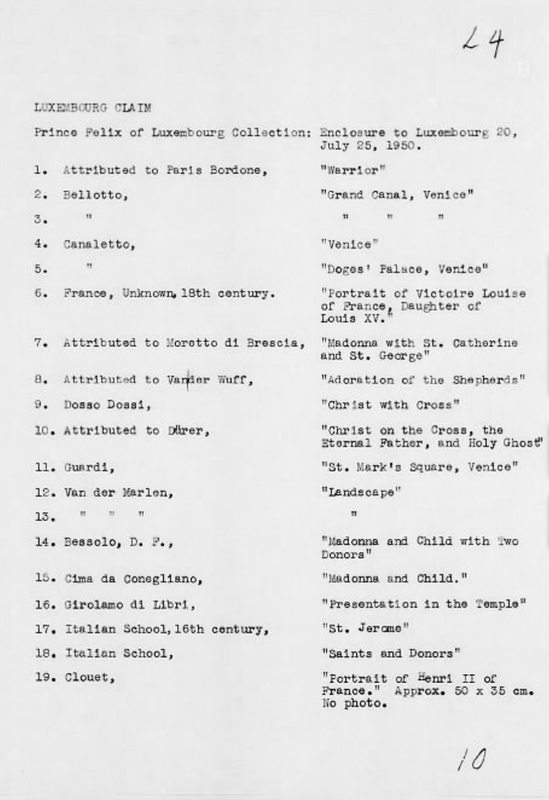 Ms. Minton: In 2010 the World Jewish Restitution Organization found that out of many named Eastern European countries including Belarus, Bosnia, Bulgaria, Estonia, Hungary, Latvia, Lithuania, Macedonia, Poland, Romania, Serbia, Slovenia and the Ukraine, only the Czech Republic and Slovakia had both enacted restitution laws governing art and were conducting provenance research. This is an important point as the former Soviet Union indirectly looted the Jews of their art which was confiscated and collected by the Germans during World War II. In many cases there are no records or unreliable records to prove provenance. 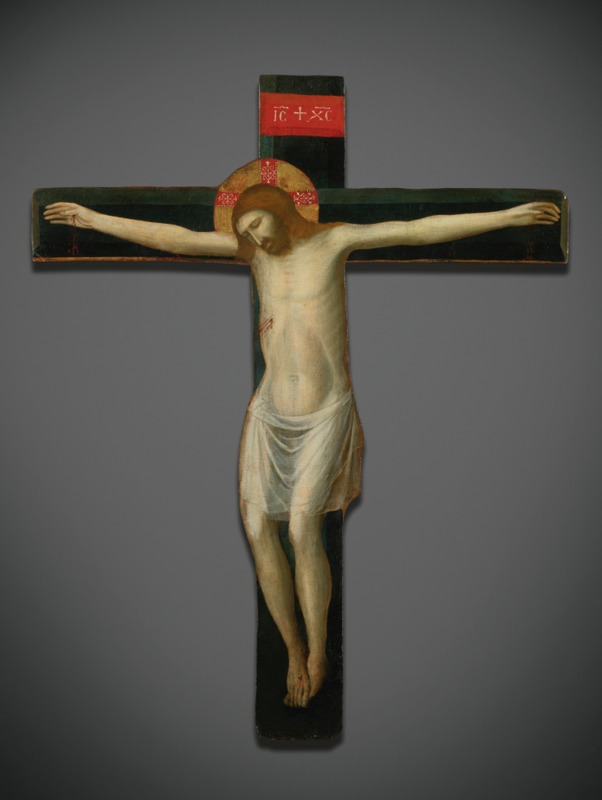 With artwork now popping up in the United States with more frequency (whether on the auction block, in a museum or in a private collection) rightful claimants are able seek restitution in the U.S. Courts where the statute of limitations may have run out in European countries. 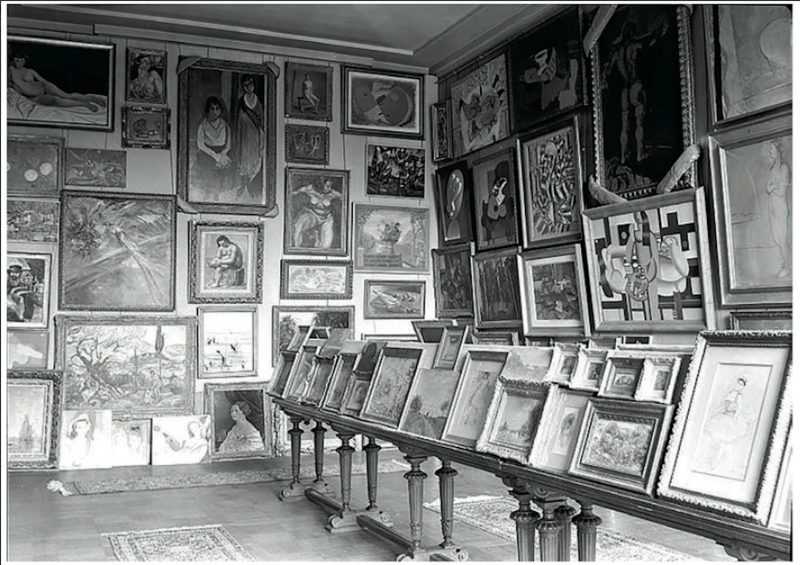 Historically the European courts have sided with those that could prove they acquired looted works in “good faith”. Because of the complication in these legal cases involving issues such as the statute of limitations, international law and provenance determination, I believe you will see a general rise of interest in art law from the public. I first became fascinated by the procedural problems in my International Litigation class at Catholic University of America Law School in Washington, D.C. and continued my research after graduation. 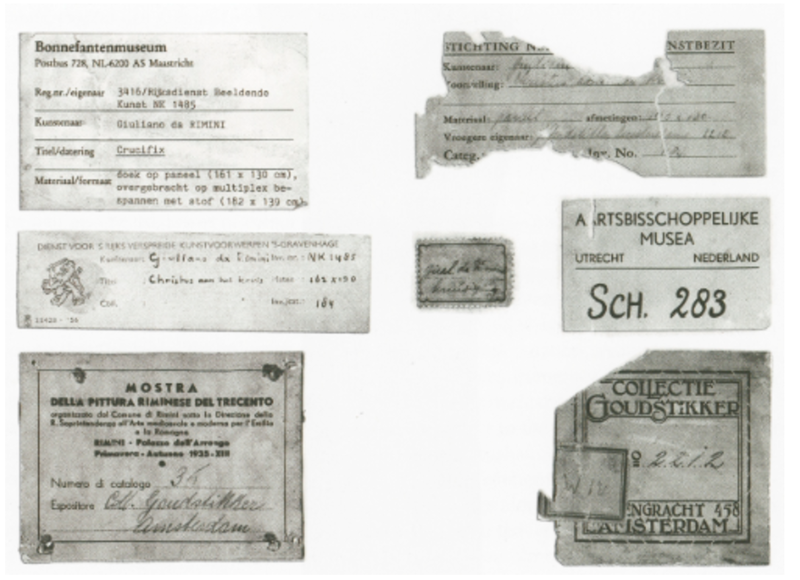 ARCA blog: In your article, you discuss Malevich v. City Amsterdam, the facts of the case stretch back to the 1920s when Malevich was forced to leave an exhibition in Berlin and return to St. Petersburg. When the artist died in 1935, was the art he left behind still unsold? And then it was ‘on loan’ to various friends and institutions such as the Stedelijk Museum in Amsterdam, the Museum of Modern Art and the Solomon R. Guggenheim Museum in New York until his heirs began suing for recovery of the art after the collapse of the Soviet Union? Ms. Minton: In 2003, fourteen of Malevich’s works appeared for the first time in the U.S. On loan from the Stedelijk Museum in Amsterdam, they were part of an exhibition at New York’s Solomon R. Guggenheim Museum. How did this happen? Malevich became a Master of “Suprematism” in Moscow in 1915. In 1927 the Soviet government demanded he return to St. Petersburg when he was exhibiting his work at the Great Berlin Art Exhibition. 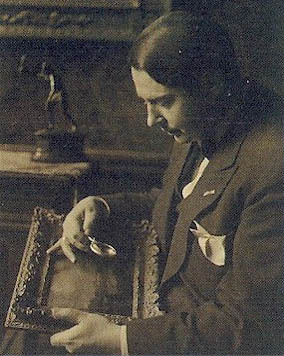 The works were left behind with friends and he never returned to Germany, dying in 1935. Little is known how these works were scattered across Europe and then to Canada and the United States except that dozens of pieces were sold by a German architect to the museum in Amsterdam. So, yes, some of the art left behind was sold, at least a portion of it. 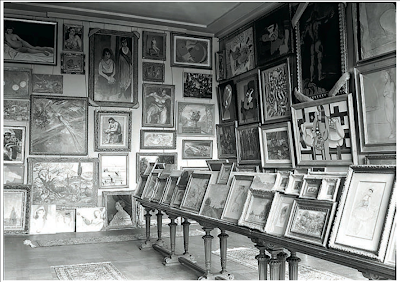 Where and when these and other looted works will appear is part of the larger story of art restitution and its eventual rise in art law. Dr. Patricia Kennedy Grimsted is a Senior Research Associate at the Ukrainian Research Institute and an Associate of the Davis Center for Russian and Eurasian Studies at Harvard University and an Honorary Fellow of the International Institute of Social History (Amsterdam). 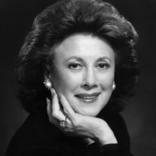 She received her Ph.D. in Russian history at the University of California, Berkeley in 1964 and has taught at several universities, including American University and the University of Maryland. Among many fellowships and awards, she was a Fellow at the United States Holocaust Memorial Museum (2000-2001), and in 2002 she received the Distinguished Contribution to Slavic Studies Award from the American Association for the Advancement of Slavic Studies. 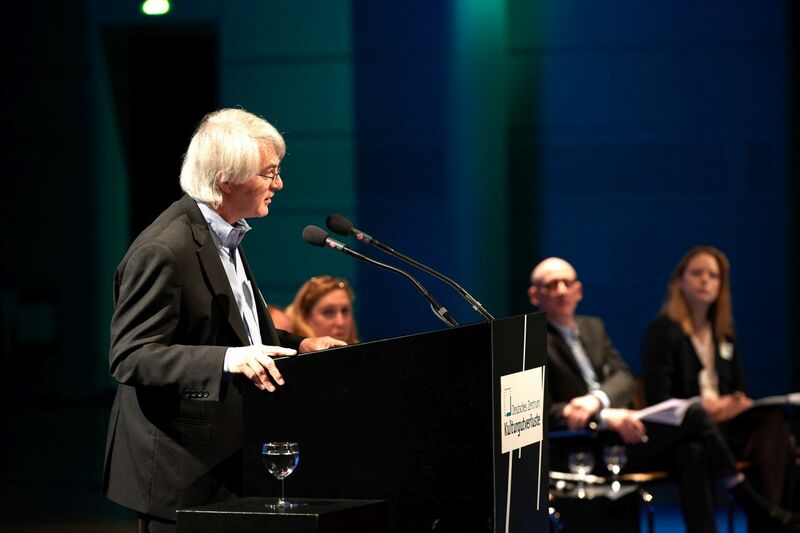 Dr. Grimsted is the West’s leading authority on archives of the former Soviet Union, the Russian Federation, Ukraine, and the other Soviet successor states. She is the author of several historical monographs, documentary publications, and a series of directories and many other studies on Soviet-area archives, including the comprehensive Archives of Russia: A Directory and bibliographic Guide to Holdings in Moscow and St. Petersburg (Russian edition, 1997; English edition, 2000). 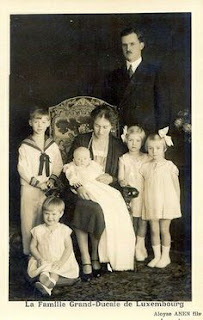 She currently directs the Internet version of ArcheoBiblioBase, a collaborative electronic directory project with data from the Federal Archival Service of Russia, maintained by the International Institute of Social History (Amsterdam). She has also written widely on World War II displaced cultural treasures (see below). In 1990 she was responsible for revealing information about the archives from all over Europe that were captured by Soviet authorities after the war and long hidden in Moscow. With Dutch colleagues she edited the volume Returned from Russia: Nazi Archival Plunder in Western Europe and Recent Restitution Issues (Institute of Art and Law, UK, 2007), soon to be released in an updated paper edition. Most recently, she edited and was a major contributor to the collection Spoils of War v. Cultural Heritage: The Russian Cultural Property Law in Historical Context, published as International Journal of Cultural Property 17, no. 2 (2010). She is currently consulting for the Conference on Jewish Material Claims Against Germany, and has just completed the guide Reconstructing the Record of Nazi Cultural Plunder: A Survey of the Dispersed Archives of the Einsatzstab Reichsleiter Rosenberg (ERR), soon to be released on the Internet, which is already serving as the basis for virtual display of many dispersed fragments, in cooperation with the Bundesarchiv (German Federal Archives). 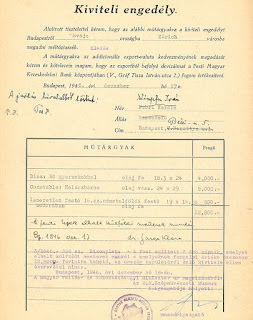 ARCA blog: You write about meeting a retired Belarusan professor of French philology, Vladimir Makarov, who had found in Minsk books with autographs of French writers such as André Gide, André Malraux, and Paul Valéry. He told you in 2003 that he had not found anyone else so concerned about the provenance and fate of these books. More than six decades after World War II, what is it about these stolen and misplaced libraries that is so compelling for you? And are you surprised that these volumes have not been destroyed? Dr. Grimsted: Over the past decade and a half there has been a renewed interest in the fate of cultural valuables looted during the war. 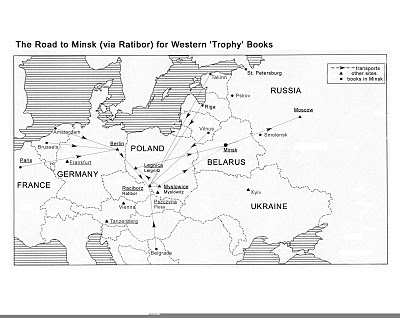 I find it tragic that many of these books were looted from Holocaust victims and other prominent individuals in Western Europe, and that unlike countries in Western Europe, the Soviet Union never made any effort to return them to their owners. 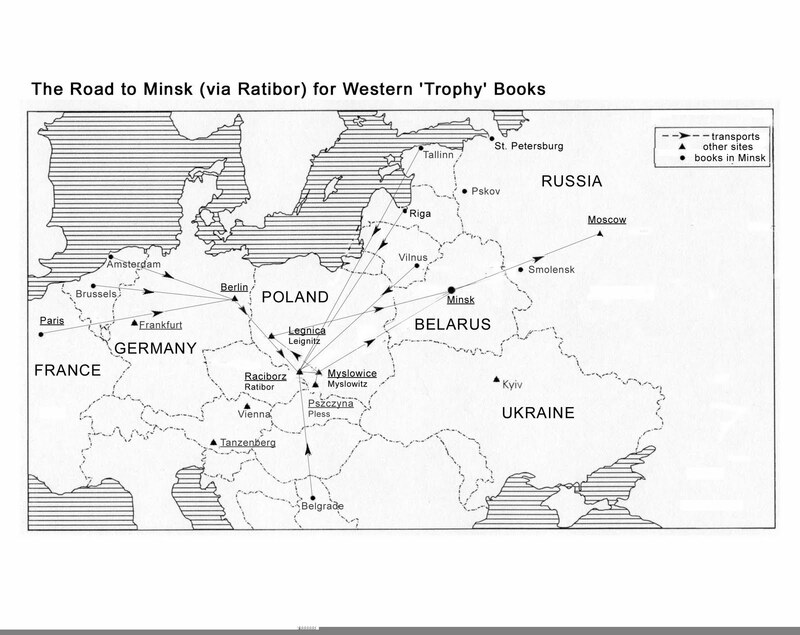 Only since the 1990s have we learned about the fate of the art, archives, and libraries books looted a second time by the Soviets after the war. 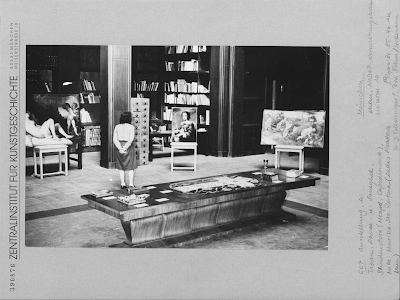 Some of the volumes from Western Europe the Soviets captured were destroyed, but close to half a million survived. The rare books that were hidden away for half a century in Belarus, many with famous autographs, are finally being catalogued. However, Belarus librarians have no interest in returning them to their owners, and prefer to consider them “compensation” for their own war losses..
ARCA blog: You write that owners of half a million plundered books from Western Europe and the Balkans that went to Minsk (and another half million plundered from Soviet libraries) never knew that their books had survived and been “saved” by the Red Army. The information was classified or secret for half a century. 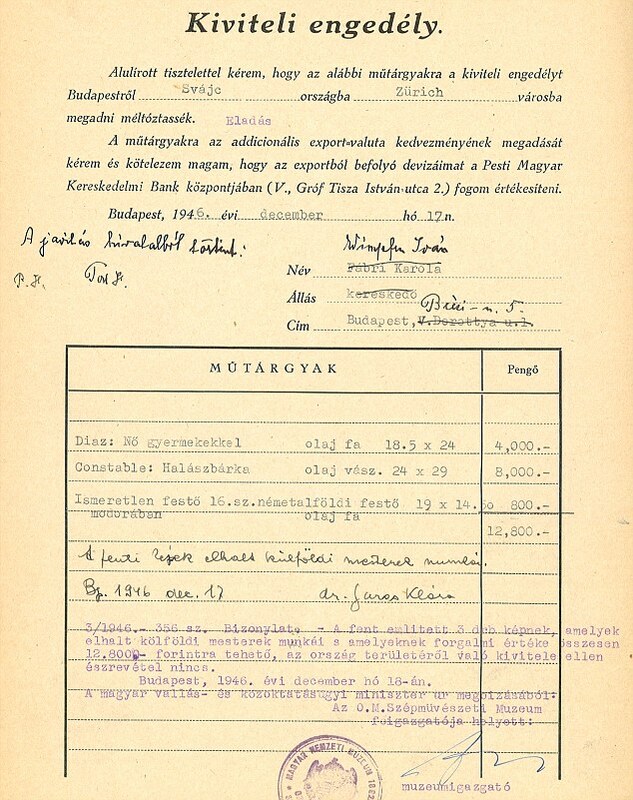 You think that even today the Rothschild family or the heirs of Léon Blum, Georges Mandel, or Louise Weiss may not know that some of the treasures from their family libraries traveled to Minsk. Are people making inquiries now that ERR records of plunder are being gathered, digitized and made available on the internet? Dr. Grimsted: Some of those people have learned about the books that went to Minsk after my articles revealed the story of their fate, and there have been a number of inquiries about them since. There is considerable interest, especially among the families and heirs of Holocaust victims in learning more details, and even the suggestion of setting up a database about the looted collections.